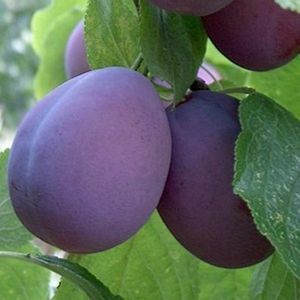 Belle de Louvain - 2 year old £17.50 - Plums Apple Trees and Fruit Trees For Sale. Buy at competitive prices with wholesale discounts. Belle de Louvain is an excellent cooking plum. It is a vigorous tree and a reliable and heavy cropper producing large, dark-red fruits with a dry texture and an excellent flavour when cooked. <br> <br> It has frost resistant blossom, making an excellent choice for northern parts of the country and more exposed sites. It will also crop in semi shade such as a north facing wall, although as it is self sterile it requires a pollinating partner. Belle de Louvain is an excellent cooking plum. It is a vigorous tree and a reliable and heavy cropper producing large, dark-red fruits with a dry texture and an excellent flavour when cooked. It has frost resistant blossom, making an excellent choice for northern parts of the country and more exposed sites. It will also crop in semi shade such as a north facing wall, although as it is self sterile it requires a pollinating partner.